HGVs are an essential part of the civil engineering industry to facilitate the construction and maintenance of roads, bridges, canals, dams and buildings. It’s essential in civil engineering that the work is completed quickly and to strict time frames, as otherwise effects can be felt on both schedules and monetary loss. We have wide breadth of experience providing HGV hire services to the civil engineering industry, working with high profile clients countrywide. Here at ND Brown we provide an extensive range of HGV Hire in London, Manchester, Birmingham and the rest of the UK. We have 6 depots located the length and breadth of the country which enable us to service all areas quickly and efficiently. Within our HGV Hire division we have an extensive selection of vehicles which includes hot boxes, tippers, tipper grabs, cage tippers and 4x4s. These are available in whole array of sizes to ensure there’s a HGV Hire vehicle which is tailored to your requirements. The vehicles range from 3.5 tonne options through 32 tonne, dependant on your project size. In addition to our HGV Hire sector, we also provide high quality servicing and repairs. This is available for third party vehicles, but also ensures that all of our HGV hire vehicles are maintained to the highest level and perform when you need them most. If you’re looking to buy, rather than hire our specialist HGV vehicles, please browse through our sales page, or give us a call for our most recent stock. 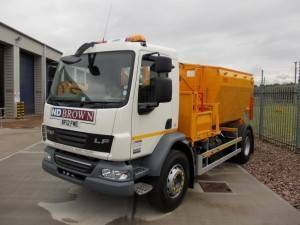 The civil engineering industry requires specialist HGV hire vehicles, with a reliable service and here at ND Brown we pride ourselves on delivering this. If you would like to find out more about our range of vehicles or our experience working in the civil engineering industry then please get in touch. We provide many contract lengths to suit all needs and projects.